Gold has been falling, and as we just mentioned, it’s about to enter a “death cross”, which is a technical analysis term that means it’s fallen hard, and people think it will fall more. But while diagonal lines on a chart are fun, there are fundamental reasons why gold is declining. It basically comes down to two things, that can be be expressed clearly in chart form. The first is real interest rates. When real interest rates are extremely low or falling, that’s good for gold. And there’s an intuitive reason for that. Collapsing real interest rates mean you’re not getting paid much for being in currency, and the real economy probably isn’t offering that much either. So, why not be in gold? 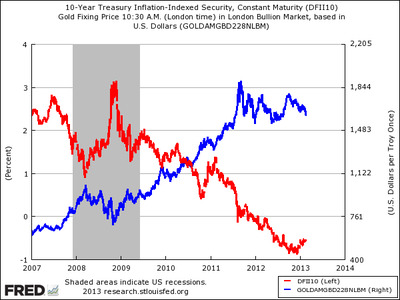 Here’s a chart comparing gold in recent year to the yield on the 10-year TIPS (inflation adjusted bonds). As you can see, gold has been a mirror image of the TIPS yield, and now that real interest rates are ticking higher, gold is seeing weakness. The other big driver of gold is fear. When people are in a panic, something in our reptilian brains tells us to buy gold, which is why it’s been around as a quasi-currency for so long. A good way to demonstrate this is by a chart which compares the VIX (an index that measures market fear) to a ratio of gold/oil. The gold/oil ratio captures the relationship between being in an unproductive shiny metal vs. being in a useful commodity that should benefit during a time of economic strength. When people are fearful, they’ll opt more for the pointless metal and drop oil. When people are confident, they’ll ask, why be in a pointless metal, when I can sell oil to the world? And here you go. The VIX (red) almost aligns perfectly with gold/oil (blue). 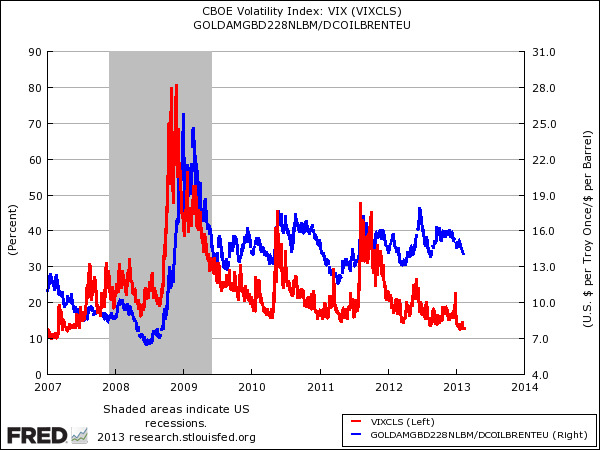 A rise in real interest rates and the collapse of fear are behind the drop in gold.